Georgia Southern University’s M.Ed. in Evaluation, Assessment, Research and Learning was recently ranked No. 8 in the nation for the Best Online Master’s in Assessment and Measurement Programs, as well as receiving the “Most Modern” recognition, according to OnlineMasters.com. The master’s in evaluation, assessment, research and learning curriculum provides students with rigorous training in research and learning that can be used for assessment and evaluation in a variety of professional settings including public schools and school districts, higher education institutions, private research and assessment firms, nonprofit organizations, and government agencies. Offered fully online, the program requires 36 credit hours of coursework, emphasizing tools and abilities such as collection and analysis of data, evaluation of programs and information, creation of assessment tools, and conducting research to make decisions based on empirical evidence. “Our combined emphasis on evaluation, assessment, research and learning offers a broader, more contemporary approach to preparing individuals for the growing number of professional research positions that require ongoing systematic assessment to maintain accountability and the successful delivery of human services,” said program director Cordelia Zinskie, Ed.D. Georgia Southern was the only university in the state of Georgia to be ranked and one of only two ranked in the southeast. “We also have an online graduate certificate program that is appropriate for those who want to develop or renew foundational research skills,” added Zinskie. The graduate Certificate in Applied Research and Evaluation is a fully online, 12-credit-hour program that offers students the opportunity to develop fundamental research strategies and apply this knowledge in various situations. In addition to insights gained from industry professionals, OnlineMasters.com conducted interviews and analyzed data from the Integrated Postsecondary Education Data System and statistical data from the National Center for Education Statistics. Only programs from accredited, nonprofit institutions were eligible. For more information about the M.Ed. in Evaluation, Assessment, Research and Learning program, visit https://coe.georgiasouthern.edu/epr. 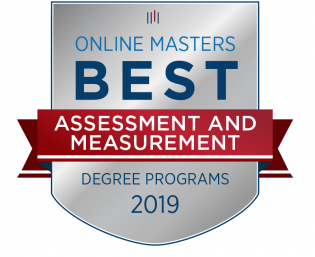 To review the Best Online Master’s in Measurement and Assessment Programs at OnlineMasters.com, visit https://www.onlinemasters.com/best-degree-programs/education/assessment-and-measurement/.